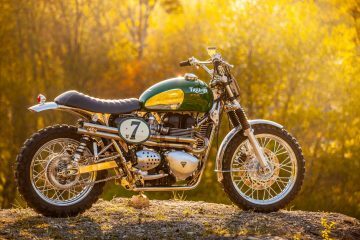 Its fair to say, that over the last few years many of the best new wave motorcycle blogs have been awash with custom Hinckley Triumph Twins to the point of saturation. 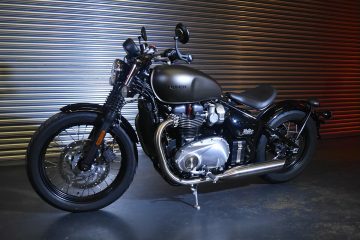 In part due to the air-cooled Bonneville’s affordability and availability, making them a firm favourite with new wave enthusiasts and custom builders alike. 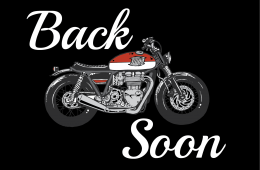 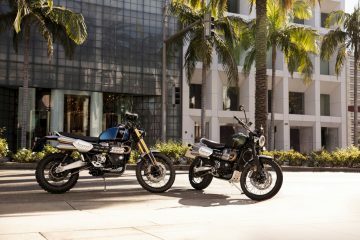 This saturation is also down to Triumphs eagerness to sell their excellent range of liquid cooled Triumph Twins to these same enthusiasts – an angle which the British company spotted too late with the previous generation of Classic Twins. 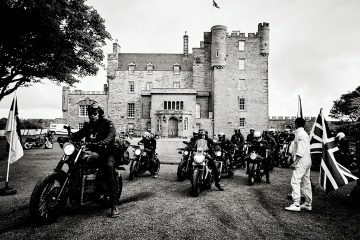 A mistake they clearly have no intention of repeating. 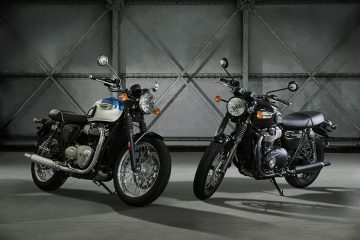 But the custom Triumph community has never needed this corporate machine limited by regulations and imagination to show it how cool either generation of Hinckley Triumph Twins can be. 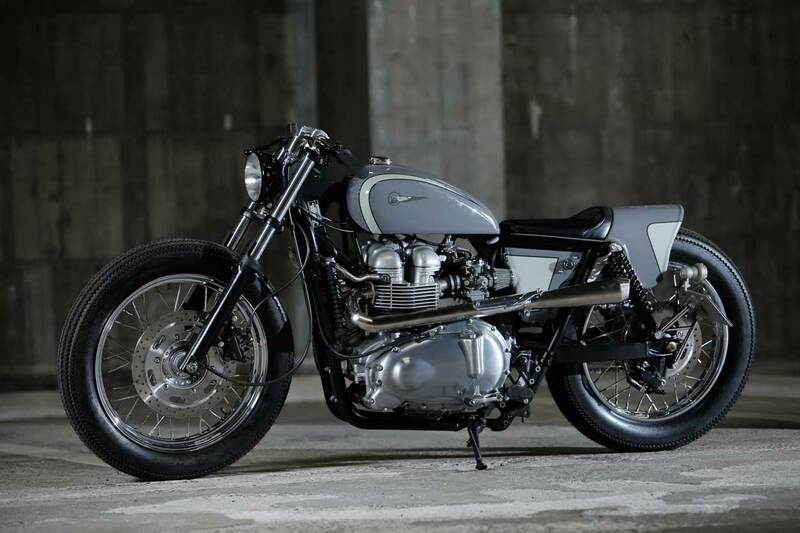 That’s the privilege of custom builders in sheds and garages the world over, Individuals who turned a retro motorcycle with an image of being ridden by old men, into something cool for a younger generation. 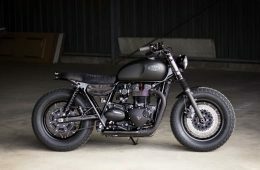 Triumph is over a decade late to the modifying party, a party which became a little boring after they crashed in with eight bottles of Sauvignon Blanc and 470 packets of cheese and onion crisps. 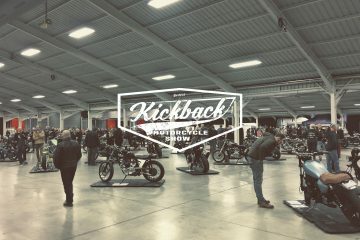 In the name of originality, it’s time to take a break from this hypothetical party, which these newcomers think is their own, especially now that many of its guests are quaffing and eating their offerings, unaware there are more interesting alternatives. 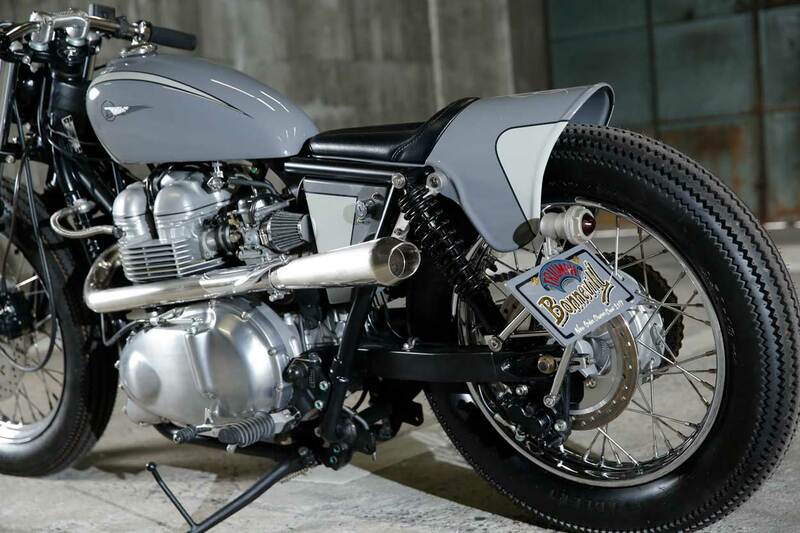 Instead, we head for Japan, still a huge influence for many new wave enthusiasts, and its the work by Kengo Kimura of Hiroshima-based Heiwa Motorcycles who’s work inspired me to open the Macbook Pro and get writing. 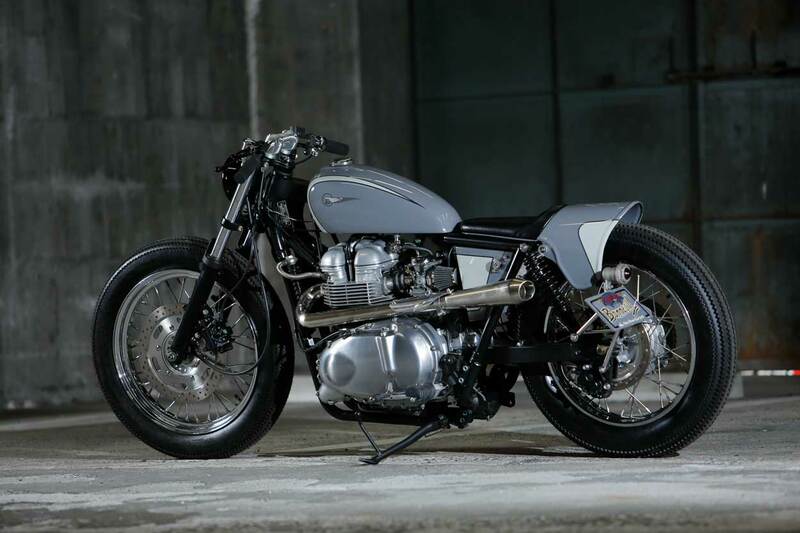 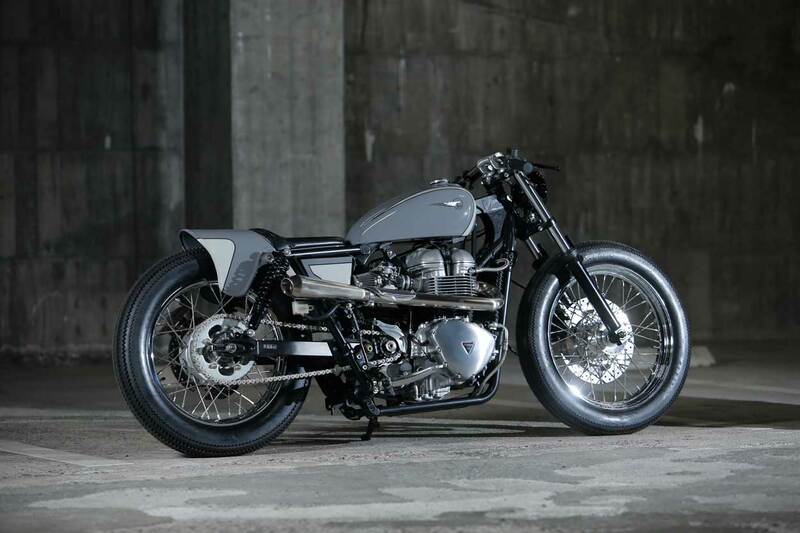 This is Kimura-sans second Hinckley Triumph build and is aptly named the 002. 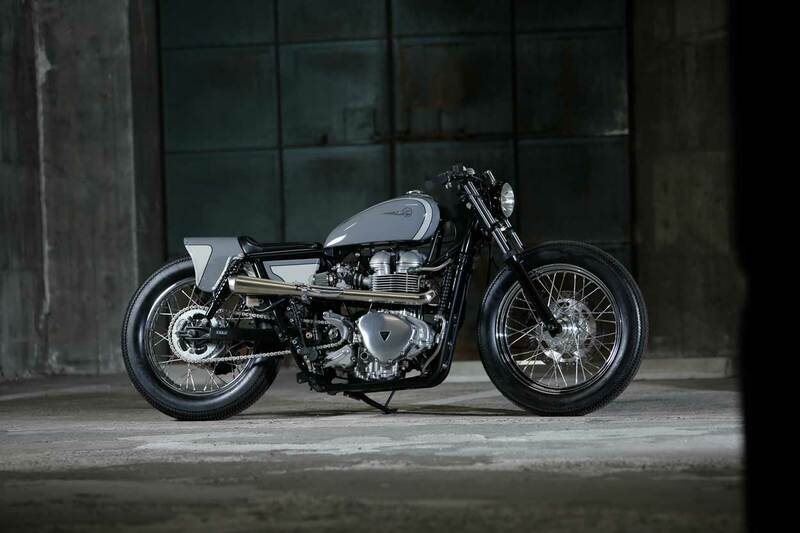 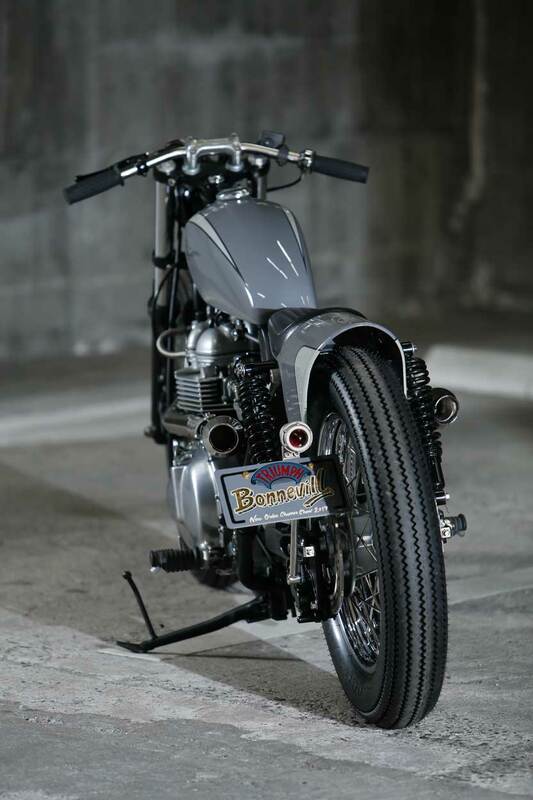 A build based on an early naturally aspirated 790cc Bonneville. 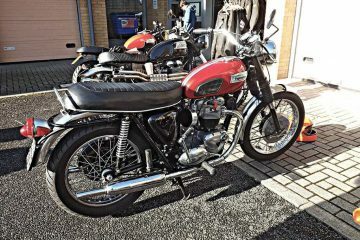 A machine with more in common with its classic predecessors than with the new ride-by-wire ABS machines. 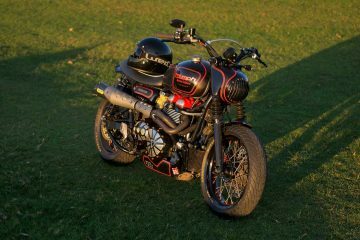 An honest Triumph Twin, simple to work on and to modify. Like the 001 featured on Bonnefication in July of last year, the 002 has had some serious back-end modifications including; removing the rear peg mounts and thinning and realigning of the rear sub-frame and shock mounts – essentially cleaning up the clunky frame and eradicating this Bonneville’s broken back appearance. 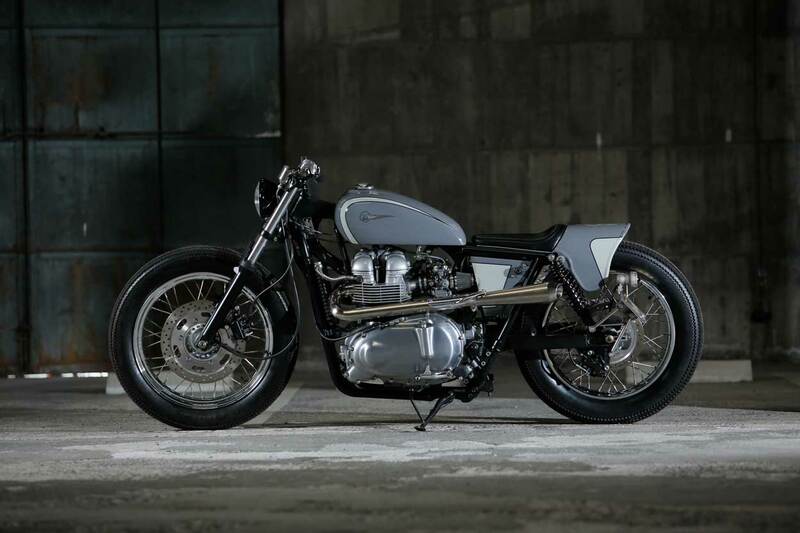 The modified Bonneville was then dropped 70mm onto its 19 inch front and 18 inch rear wheels, which are shod with classic Firestone style tires (4.00/19 and 4.50/18 respectively) adding a touch of vintage cool to this Triumph Twins long and low stance. 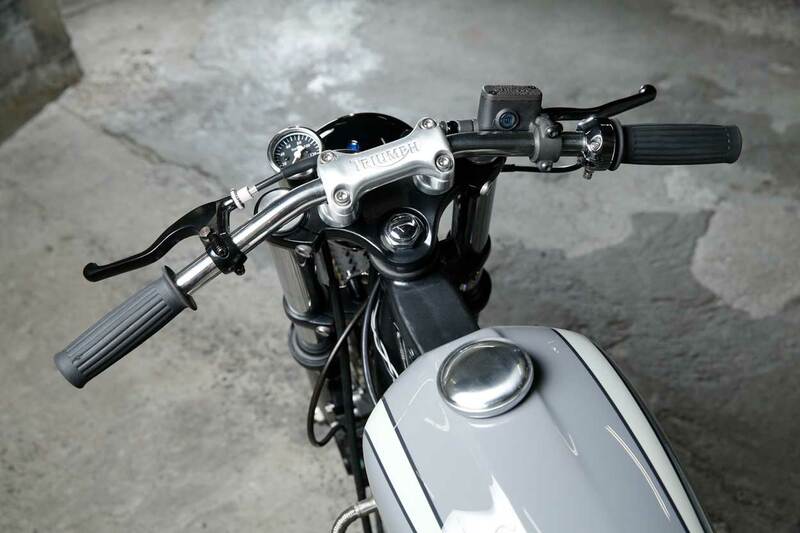 Finished in pale blue and white, this Bonneville, which now sports a short custom tank, leather seat and Speedway styled mudguard, is pretty eye-catching. 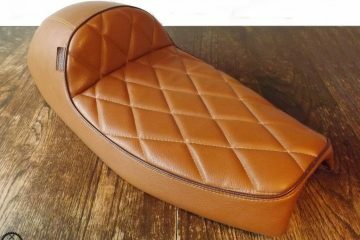 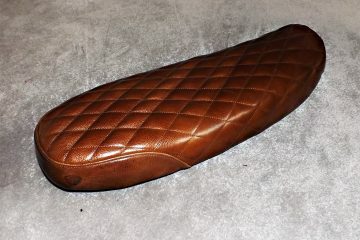 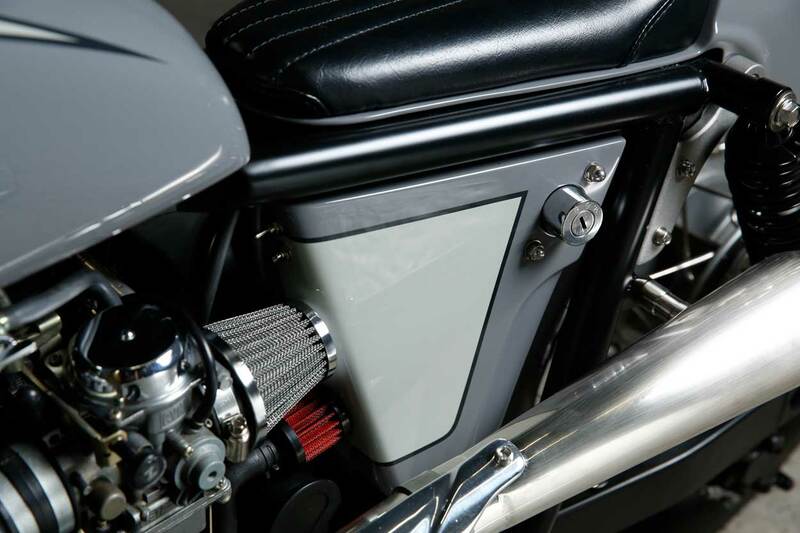 Below the seat is a pair of bespoke side panels painted to match. 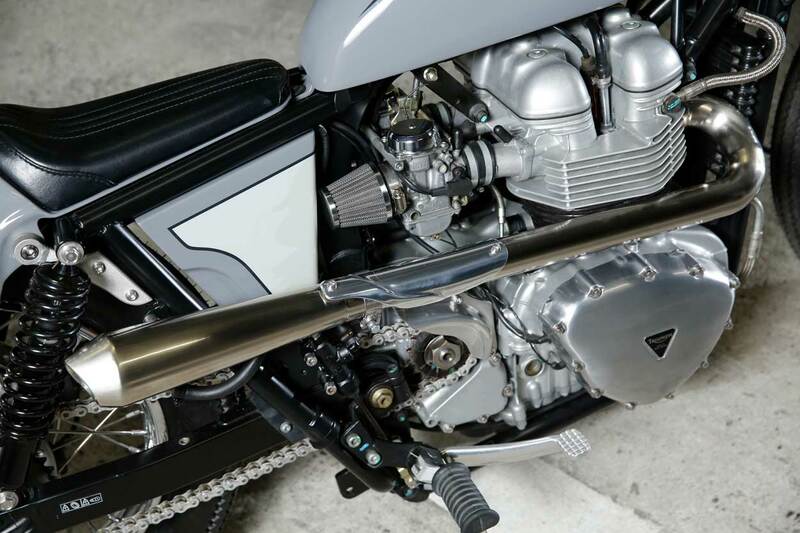 The left-hand panel now plays host to the relocated ignition and kill switch, moved from the stock Bonneville bars which were swapped for a set of Heiwa’s own 40’s vintage items, fitted with Slim grips, brake reservoir and a retro throttle body. 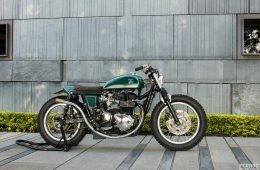 With the ignition and switchgear either ditched or relocated, a compact 5.5 inch Betsuraito bottom mounted headlight and mini speedo could be fitted, slimming down the Triumphs usually bloated front end. 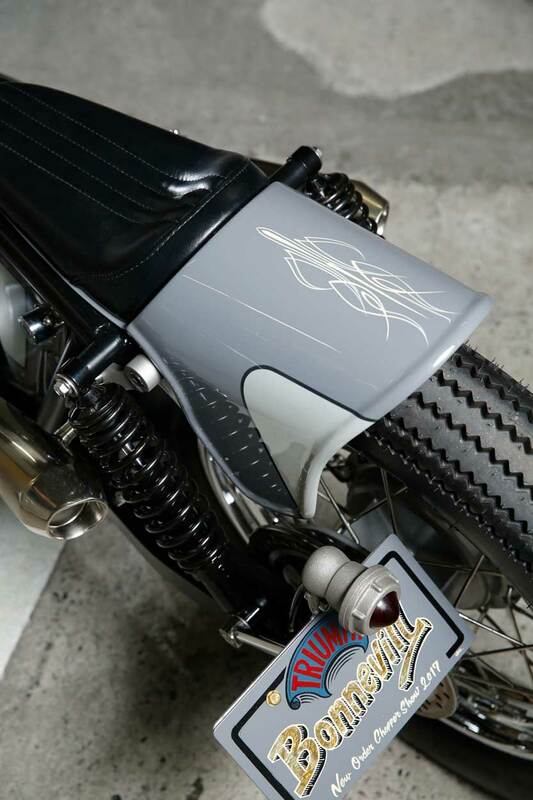 Other details on this build include custom sprocket cover and one-off upswept two into two high pipes, which vent just short of the rear shocks. 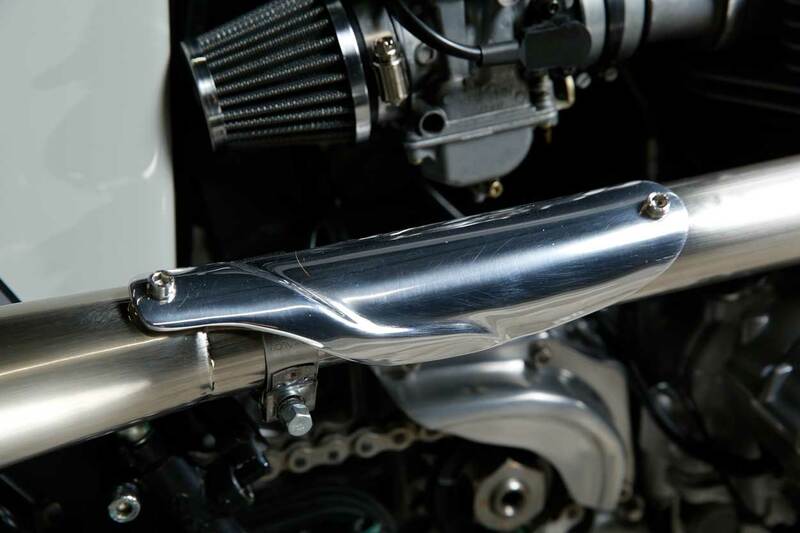 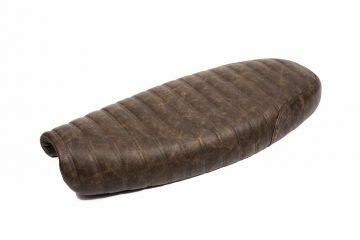 An exhaust, which, fortunately, hasn’t been wrapped, but instead wears a set of scalloped heat shields. 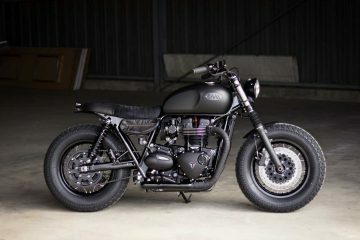 With a better exhaust, comes the need for better induction, with this Bonneville being fitted with a set of Power Filter air filters When building a custom, small practicalities can often get in the way of slick styling, the number plate for example, is a real pain in the arse and can really ruin the look of the back end of a motorcycle. 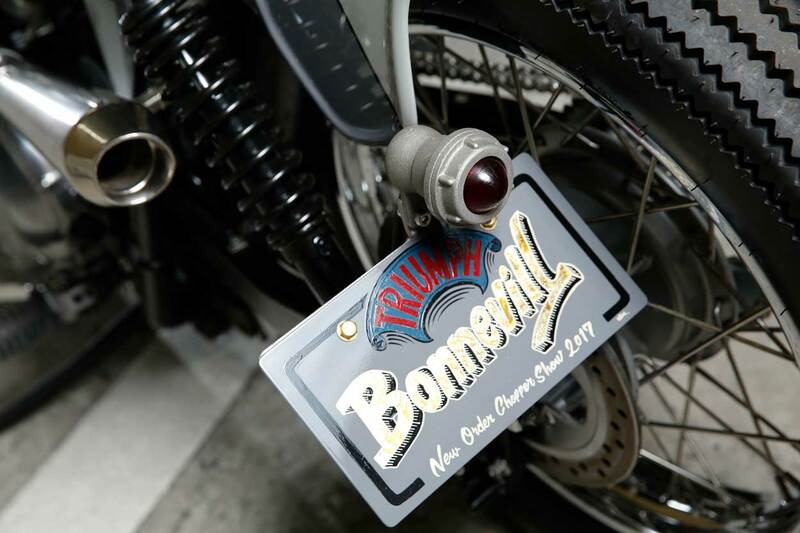 Side mounted number plates in many cases are the answer, especially if it looked as good as that fitted by Kengo Kimura of Heiwa Motorcycles. 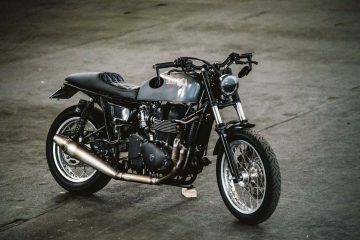 Whatever your thoughts are on builds such as the 002, at least it is not mundane, and for me, that’s what matters, and to quote Triumph ‘ Go Your Own Way’ good advice.